It is raining, and I am running some errands. I have never ridden my scooter in the rain, so I am a little nervous. Perhaps this is the reason why I cleaned my plate at Good Eats Grocer after I finished my errands. I tend to eat too much and too fast when I am nervous. 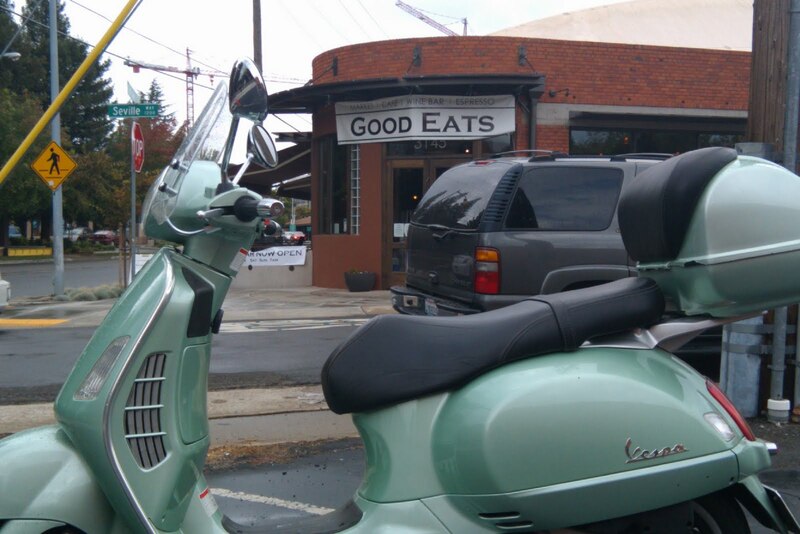 Good Eats Grocer is a misnomer. Yes, one can buy things like wine, baked goods, prepared meals, cheese, produce, and meats, but in limited quantities and varieties. Good Eats Grocers (or just Good Eats) is banking on the word “select” to bring in “select” people interested in “select” groceries. The place has a small footprint (the old Andiamo at Folsom Blvd and Alhambra) and has only one or two checkout stands. The store also has a pizza station, a bar, and a restaurant with a small but varied menu. One of those items is the Bistro Burger and that is why I am here. I tried to order my burger at the wrong station because there was no one at the host station so I assumed (this being a grocery and all) that I should go to the deli station to order my lunch as I do at Raley’s or Safeway. The nice man in a pristine white chef’s coat pointed towards the front door where a host seemed to materialize out of thin air. Okay, so Good Eats is so urbane and California hip that the square customers like me need a tutorial on how to use the place, but what about the burger. First, here is the basic facts: the Bistro Burger is comprised of a 1/3 lb beef patty, cheddar, jack, or S wiss cheese, tomato, lettuce, raw red onion, pickles, and mayonnaise on a large bun. 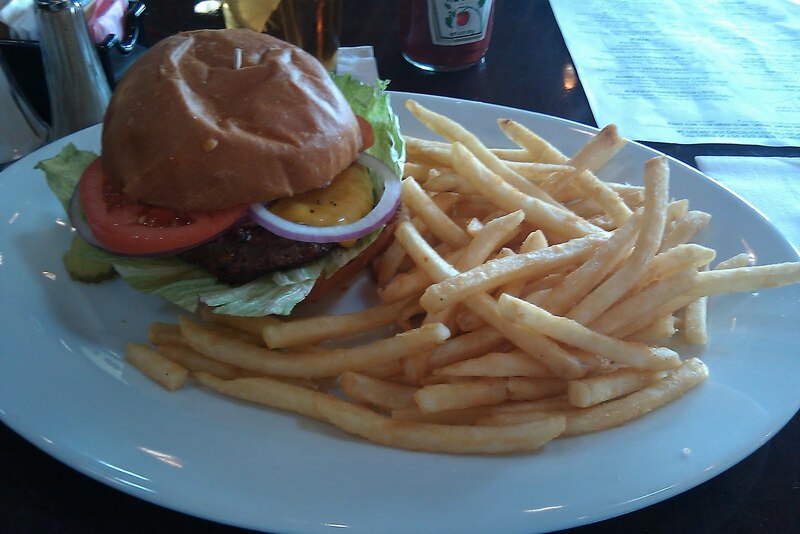 Not bad on paper, but where things got dicey is when I bit into it burger. Sure it looks nice with its big bun and the tomato and onion slices conspicuously pushed out of the burger to give it an distinctive look, but it does not taste right. When I pull away and look, I see it is solid pink. The burger is charred on the outside, the way I like it, but decidedly pink on the inside meaning it was grilled too hot too fast. There were only three other tables occupied and all of them appeared to have been served. For that matter there was no one at the bar, deli and pizza stations, and no one in the “grocery.” A busy restaurant is no excuse for an undercooked meal, but there were no orders coming in and the help were all just standing around. I was here with my wife to check out the new place a couple weeks earlier and it was just as slow. If nothing else I should not have finished the burger, but that is not how I am wired, alas. The same goes for the fries, but for a entirely different reason. The fries were excellent—crispy and seasoned to perfection. The problem with this was there were far too many—more like a plate for two. When I left the building the weather was much nicer, but my stomach was killing me. I do not know if it was from eating an undercooked burger or eating too many fries. The wise words of my wife come to mind as I put on my riding jacket, hoping I do not trigger my vomit launch when the zipper rolls over my aching paunch. She often tells me not to waist calories on food you do not like. I really did not like this burger. 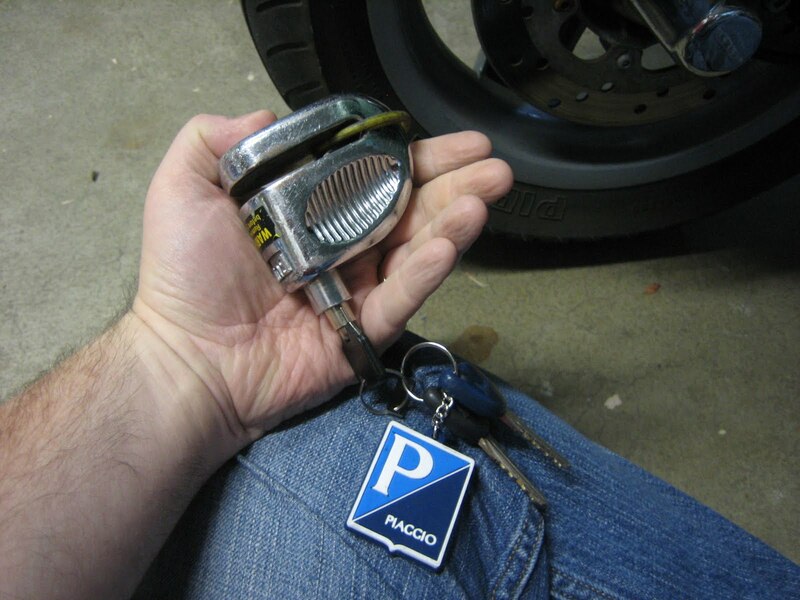 My Vespa has a locking steering column which when employed protects against theft, but for those who have vintage scooters or someone who wants another layer of security there are other ways to reduce scooter theft. One of these is disc lock. 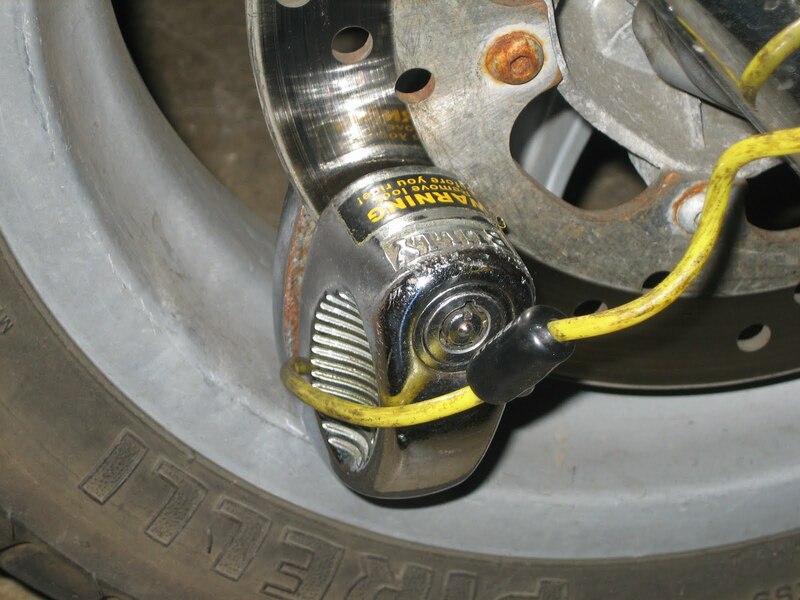 A disc lock is usually made of hardened metal and is mounted on a hole in your front disc brake. The lock usually comes with a lock-reminder cable that the operator loops around the handlebar. The reminder cable ensures the operator does not try to ride off with the lock still in place. While this system works, it is cumbersome and time consuming to operate. For this reason, I rarely employ mine.